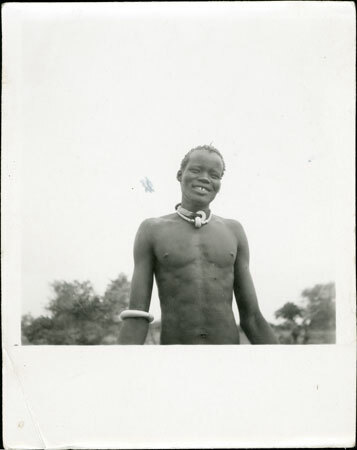 An upper body portrait of a Dinka youth (identified as Baak Kuc) wearing beaded neck ornaments and an (ivory?) arm ring. Lienhardt notes that he was "part of my entourage". Morton, Chris. "Dinka youth wearing beads" Southern Sudan Project (in development). 03 Jan. 2006. Pitt Rivers Museum. <http://southernsudan.prm.ox.ac.uk/details/2005.51.465/>.